So, you did it. Your hard work has paid off and you were promoted to manager. Congrats! Becoming a new manager can be both exciting and intimidating. You are not by any means inexperienced, but your knowledge of management has likely been academic, abstract or observed as a team member. As a manager, you are no longer watching, you are doing. And your actions are being judged by those around you. While you wouldn’t be here if you didn’t have the qualifications, there is still some learning to be done as you adjust to this new position. Management is not easy, as it requires many skills including areas that generally get better with experience like communication, coaching, motivating and listening. But everyone needs to start somewhere, right? 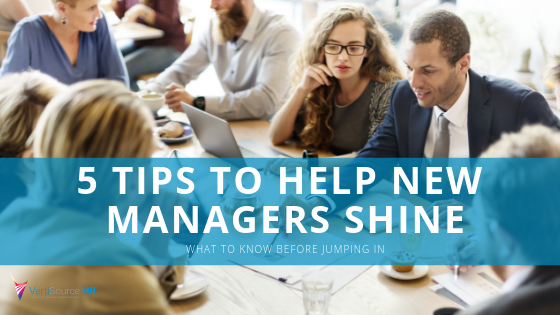 Here are 5 tips to help new managers shine and feel more confident in their new role. You are now the “go to” person in charge, which means you need to really understand the company you are working for. You need to be prepared to address questions from your direct reports that take into account the broader landscape of the company. From strategy to culture and HR issues, you need to know what is happening across the business so you can make informed decisions while confidently providing direction. If you are making the shift from employee to manager, you’ll have to adjust from the more detail-orientated approach you took on in your previous role. As a manager, you will need to look at the company through a wider lens, focusing on the big picture of your employee’s projects and their objective for the company. While you might feel compelled to coach your team every step along the way, it’s crucial that you take a step back. Don’t do their work for them. As their new leader, your job is to guide them by setting goals and aligning everyone to meet them. Support your team, but also keep your distance so they can set up to the plate. Individual time with your direct reports is critical towards their success and overall career development. One of the best ways to accomplish this is through productive meetings. Stay away from long, pointless sessions as this often doesn’t accomplish anything. Instead, focus on agenda-based meetings that can be held for the whole team and on a one-on-one basis. Not only will you get various perspectives that will broaden your understanding of the work environment, but you can address concerns too. Block the time from your calendar and do your best to respect this time allotted for your team. Another tip is to meet regularly with upper management. You can give them a report of your progress and get a good idea of their expectations. This will keep you and your team aligned with overall business strategies, and help you stay in the good graces of everyone in the company. To avoid this, get to know your team and treat them as individuals, not an ostracized group. This applies to more than just age gaps. You are going to be working with people of various genders, races, and religions. Remember everyone brings a unique perspective that can help achieve business goals for the company. You might feel that you either need or want to be involved in everything your team is working on. However, you can’t be everywhere at once. Therefore, you need to create an environment where you are actively relying on others to help carry projects. While you will still be informed of the status of these projects, thanks to your communication skills (see tip #2) you need to let others lead so they can grow. In order to do this effectively, be clear on your expectations while also expressing how important the opportunity is for your team member, personally. If they understand how important their role is they will feel a greater sense of ownership towards the project and ensuring its optimal outcomes. It’s also a great way to make your team feel valued, which will, in turn, help keep employee morale up. Win, win. Seasoned Managers – What tips or ideas resonated with you? What changes would you make?